This tour showcases the Seattle area, Puget Sound, Straits of Juan De Fuca, and the many Islands of the San Juan chain presented by Seattle’s premier float-plane charter flight and scenic tour company. Locally owned and operated, we are dedicated to providing unsurpassed aerial views of the Emerald City and panoramic Northwest vistas. Your pilot will give a personal narration and all the clients are issued noise canceling aviation headsets. The sensational experience of taking off and landing on the water combined with the amazing views of Seattle, the Pacific Northwest wilderness, and Puget Sound come together to create the memory of a lifetime. 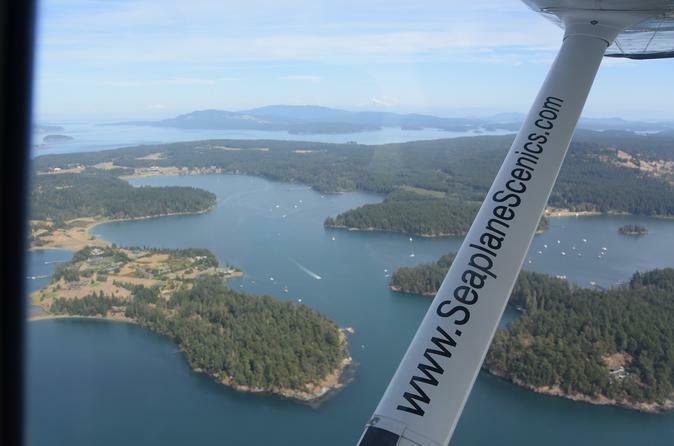 Seaplane Scenics is the ultimate choice for experiencing a float-plane tour of the San Juan Islands and environs. Depart Carillon Point Marina in Kirkland: 1200 Carillon Point Kirkland WA 98033. Pay and Valet Parking available. Meet your pilot at the Guest Pier in front of the Beach Cafe. Depart the Wiley Post Seaplane Base: 1000 Perimeter Road West Renton WA 98057. Enter the Renton Airport from Rainier Ave, turn left, drive to the end of the road to the spacious free parking. Park near the US Customs Building and walk over the grassy knoll to the waterfront. Leave long drives and traffic behind to get a complete, succinct orientation of Seattle, Pacific Northwest mountains, and the Puget Sound. There’s simply no better way to get familiar with the Northwest than by soaring over it. Our customers are provided with comfortable, noise cancelling headsets to clearly hear the pilot’s personal narration during the flight. Our professional, knowledgeable and enthusiastic pilots will point out historical sites, interesting features and fun facts throughout your excursion. Among many of the captivating views you’ll enjoy are – Lake Washington and it’s distinct floating bridges, sweeping views of Seattle’s skyline, the Cascade and Olympic mountain ranges, flying across the straits of Juan de Fuca and through the San Juan Island chain. Providing flexibility to suit customer needs, our tours are available throughout the year. We are dedicated to providing customers with a safe, comfortable and memory making experience. We look forward to taking you to new heights!